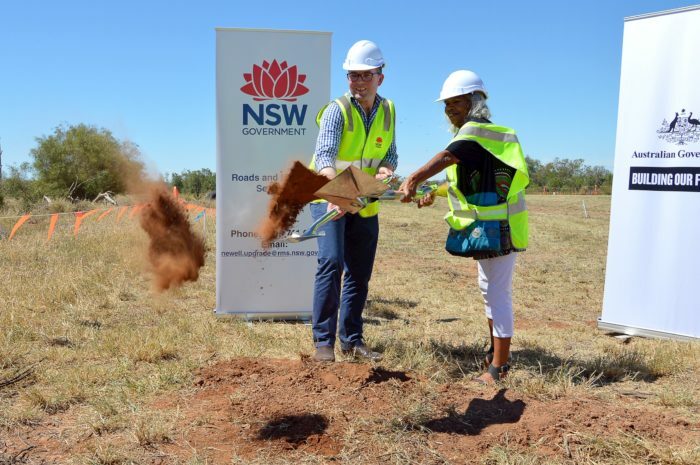 Northern Tablelands MP Adam Marshall, left, and local Aboriginal Elder Aunty Elaine Edwards turn the first sods of soil on the $122 million Newell Highway upgrade project, south of Boggabilla. IMPROVED safety and freight transport productivity are on the cards for the Moree Plains Shire, with the start of the $122 million Newell Highway upgrade project, south of Boggabilla. Northern Tablelands MP Adam Marshall recently turned the first sod of soil on the project, which is officially the largest roads project in NSW west of Great Dividing Range. He said both State and Commonwealth Governments were investing $61 million each in the road upgrade, which would see 18 kilometers of the Newell completely replaced and upgraded between Mungle Back Creek and Boggabilla, for the first time since 1973. “This is a massive road project, the likes of which our region hasn’t seen for around four decades,” Mr Marshall said. Mr Marshall said the works would provide a vital economic boost to communities along the route. “This is a great example of the NSW and Australian governments working together to improve productivity and make roads in the bush safer for truckies and farmers,” Mr Marshall said. “Our region relies on the highway to move products from paddock to plate. Federal Member for Parkes Mark Coulton said the upgrade would provide wider lanes and road shoulders, intersection improvements and new overtaking lanes. “These works will provide a new road surface to meet the existing and future freight needs along the Newell Highway as well as improve the highway’s flood immunity,” Mr Coulton said. The Newell Highway is part of the $229 million National Highway Upgrade Program which is set to improve the safety, efficiency and dependability of this vital inland road corridor.